In rodents, the cell surface complement regulatory protein CD46 is expressed solely on the spermatozoal acrosome membrane. Ablation of the CD46 gene is associated with a faster acrosome reaction. Sperm from Apodemus flavicollis (yellow-necked field mice), A. microps (pygmy field mice) and A. sylvaticus (European wood mice) fail to express CD46 protein and exhibit a more rapid acrosome reaction rate than Mus (house mice) or BALB/c mice. A. agrarius (striped field mice) belong to a different Apodemus subgenus and have pronounced promiscuity and large relative testis size. The aim of this study was to determine whether A. agrarius sperm fail to express CD46 protein and, if so, whether A. agrarius have a faster acrosome reaction than Mus. Reverse transcription polymerase chain reaction (RT-PCR) was used to assess whether A. agrarius transcribe testicular CD46 mRNA. RT-PCR was supplemented with 3'- and 5'-rapid amplification of cDNA ends to determine the complete nucleotide sequence of A. agrarius CD46. Fluorescence microscopy was used to assess whether CD46 protein is expressed by A. agrarius sperm. The acrosome status of A. agrarius sperm was calculated over time by immunocytochemistry using peanut agglutinin lectin. We demonstrate that A. agrarius mice transcribe two unique alternatively spliced testicular CD46 mRNA transcripts, both lacking exon 7, which differ from those described previously in other Apodemus species. The larger A. agrarius CD46 transcript has an insert between exons 10 and 11 which, if translated, would result in a novel cytoplasmic tail. In addition, A. agrarius CD46 transcripts have an extended AU-rich 3'-untranslated region (UTR) and a truncated 5'-UTR, resulting in failure to express spermatozoal CD46 protein. We show that A. agrarius has a significantly faster spontaneous acrosome reaction rate than A. sylvaticus and Mus. Absence of CD46 protein expression is associated with acrosomal instability in rodents. A. agrarius mice express novel CD46 transcripts, resulting in the trade of spermatozoal CD46 protein expression for a rapid acrosome reaction rate, in common with other species of field mice. This provides a strategy to increase competitive sperm advantage for individuals, leading to faster fertilisation in this highly promiscuous genus. There is pronounced sperm competition in species belonging to the Apodemus genus (field mice), which is reflected by their disproportionately large testes [1, 2]. There is also an association between relative testis mass and the shape of the apical hook in the falciform head of murine sperm . The extremely long apical hook of A. sylvaticus spermatozoa enables them to intertwine, forming in vivo trains of up to 100 cells . These sperm formations have significantly increased velocity and thrusting force compared with an individual spermatozoon. The A. sylvaticus sperm trains must dissociate prior to fertilisation, which may be achieved by a proportion of sperm undergoing a spontaneous acrosome reaction . CD46 (membrane cofactor protein) is a widely expressed cell surface complement regulatory (CReg) protein in humans. In contrast, in rodents, CD46 protein expression is not widespread but instead is restricted solely to the spermatozoal acrosomal membrane, suggesting that CD46 has a role in the reproductive process [5–9]. The murine CD46 gene contains exons encoding four short consensus repeat (SCR) regions, a serine/threonine/proline-rich (STP) region, a juxtamembranous region of unknown function (UK), a transmembrane (TM) region and a cytoplasmic tail (CYT) region [10, 11]. Disruption of the CD46 gene in laboratory mice induced a faster acrosome reaction rate compared with wild-type control mice . Sperm from wild-caught A. flavicollis, A. microps and A. sylvaticus, belonging to the Sylvaemus subgenus, have been shown to exhibit a more rapid acrosome reaction rate than wild-caught Mus musculus or inbred BALB/c laboratory mice . Abnormal testicular CD46 mRNA transcripts lacking exons 5–7 and 6–7, together with extended 3'- and truncated 5'-UTRs, were detected in these species, resulting in failure to express CD46 protein on testicular or epididymal sperm. It was proposed that these species have traded CD46 protein expression for acrosomal instability to favour more rapid fertilisation . In contrast to the aforementioned Apodemus species, A. agrarius mice belong to a nominotypical subgenus of Apodemus [13, 14] and have the highest level of promiscuity in any rodent species studied to date [15, 16]. As in the ecologically diverse Apodemus species studied previously, there is pronounced sperm competition in A. agrarius for individual mating success. The aim of the present study was to determine whether sperm from wild-caught A. agrarius mice also fail to express CD46 protein and, if so, whether A. agrarius have a faster acrosome reaction than Mus. This would reveal whether failure to express spermatozoal CD46 protein is widespread in the Apodemus genus or confined to Apodemus species within particular geographic ranges. We demonstrate that A. agrarius mice transcribe two unique alternatively spliced testicular CD46 mRNA transcripts, with extended 3'- and truncated 5'-UTRs, resulting in failure to express spermatozoal CD46 protein. We show also that A. agrarius has a significantly faster spontaneous acrosome reaction rate than both A. sylvaticus and Mus. This study provides further support in favour of a role for CD46 in stabilisation of the acrosomal membrane in rodents. Male A. agrarius and A. sylvaticus mice were caught from Slovakia and the Czech Republic, respectively. M. m. musculus mice were caught from around Buskovice (Czech Republic). All mice had reached sexual maturity. Wild-caught A. agrarius, A. sylvaticus and M. m. musculus, as well as inbred BALB/c mice, were maintained in a pathogen-free facility at the Department of Zoology, Charles University, Prague, Czech Republic. All animal procedures were carried out in accordance with the Animal (Scientific Procedure) Regulations and subjected to review by the local Ethical Committee. Testicular RNA was extracted using ice-cold Trizol reagent (Invitrogen, Paisley, UK) according to the protocol provided. RNA was stored at -20°C in DNAse- and RNAse-free water. Reverse transcription (RT) of testicular RNA was performed using Superscript II reverse transcriptase (Invitrogen, Paisley, UK). RT-PCR reactions were conducted according to the ReddyMix Taq ×2 protocol (ABgene, Epsom, UK). The primers used in RT-PCR reactions when amplicons were subsequently sequenced are shown in Table 1. A murine ADAM2 (fertilin-beta) primer set was used in positive control reactions. 10 μl of CD46 PCR products and 2 μl of ADAM2 PCR products were visualised by 2% agarose gel electrophoresis and purified using the standard QIAquick PCR purification kit gel extraction protocol (Qiagen, Crawley, UK). Testicular CD46 amplicons were sequenced by primer extension using an ABI PRISM Sequence Detection System at Lark Technologies (Takeley, UK). CD46 primers used for RT-PCR, 5'-RACE and 3'-RACE reactions where amplicons were subsequently sequenced. Key: Mus musculus musculus (Mm); Apodemus sylvaticus (As). The 3'-RACE protocol was identical to the Invitrogen 3'-RACE kit protocol, except that different anchor primers were used (Table 1) and an additional nested PCR step was added. The 5'-RACE protocol was based on the Invitrogen 5'-RACE kit protocol, with the following modifications. Firstly, cDNA was not treated with RNAse and was ethanol precipitated. 16.5 μl of cDNA was used in the tailing step rather than 6.5 μl, and samples were incubated with terminal deoxynucleotide transferase for 30 minutes instead of 10 minutes. Also, different anchor primers were used (Table 1) and an additional nested PCR step was added. A rabbit anti-A. sylvaticus CD46 peptide polyclonal antiserum was raised against a 14-mer peptide (PFEAMELKGTPKLY) from the predicted SCR1 domain of A. sylvaticus CD46, as previously described . This high-titre polyclonal antiserum was affinity-purified against non-conjugated peptide immobilised to an agarose gel support using a Sulfolink kit (Perbio Science, Cramlington, UK) and eluted with 100 mM glycine buffer (pH2.8). A rat anti-rat CD46 polyclonal antiserum generated using a recombinant fusion protein comprising IgG-Fc and rat SCR2-3 CD46 domains was a kind gift of B. P. Morgan, C. L. Harris and M. Mizuno, Cardiff University School of Medicine . Epididymal sperm smears were permeabilised for 10 minutes in acetone pre-cooled at -20°C, air-dried and blocked using 3% normal goat serum for 1 hour. Slides were incubated with primary antibodies for 1 hour, followed by secondary antibodies for 30 minutes at optimised dilutions in phosphate-buffered isotonic saline. Rabbit pre-immune serum was used as a negative control, whereas the monoclonal antibody 18.6, which recognises an acrosome-associated antigen , was used as a positive control and was a kind gift of H. D. M. Moore, University of Sheffield. Slides were mounted and DNA was stained using Vectashield mounting medium with DAPI (Vector Laboratories, Peterborough, UK). Slides were visualised using an epifluorescence microscope (Olympus, Prague, Czech Republic) and images taken using a TCS SP2 RS high-speed confocal/two-photon system (Leica, Prague, Czech Republic). The distal region of the tail of the epididymis was placed into PBS for 10 minutes at 37°C under 5% CO2. The spermatozoa recovered were capacitated at a concentration of 5 × 106 sperm/ml in M2 fertilisation medium (Sigma-Aldrich, Prague, Czech Republic) under paraffin oil. Spermatozoa were collected at 5, 10, 20, 40, 80 and 120 minutes, stained to assess acrosomal status using 5 μM Alexa peanut agglutinin (PNA) lectin (Molecular Probes, Prague, Czech Republic) and immediately assessed under an epifluorescent microscope (Olympus, Prague, Czech Republic). Spermatozoa motility and viability were examined throughout experiments with a Sperm Viability Kit (Molecular Probes, Prague, Czech Republic) using an inverted microscope with a stage thermostatically controlled at 37°C. Spermatozoa viability was always greater than 86%. RT-PCR was conducted using testicular mRNA derived from two wild-caught A. agrarius mice to ascertain whether A. agrarius express unusual CD46 transcripts. 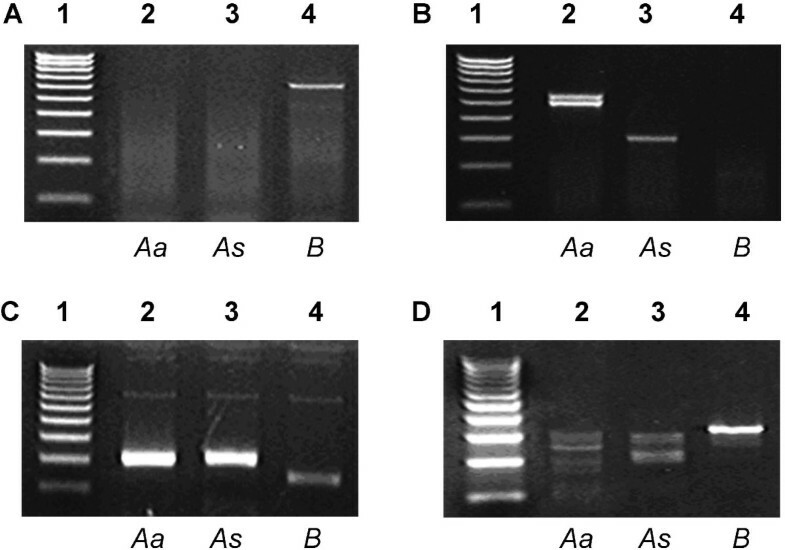 Use of a BALB/c-specific exon 5–11 primer set (Table 1) generated no product from A. agrarius or A. sylvaticus testicular mRNA (Figure 1A), whereas use of an A. sylvaticus-specific exon 5–11 primer set (Table 1) generated two cDNA amplicons from A. agrarius testicular mRNA, which were both larger (509 and 564 bp) than the amplicon generated from A. sylvaticus testicular mRNA (326 bp) (Figure 1B). A. agrarius express two novel testicular CD46 transcripts with extended 3'- and truncated 5'-untranslated regions. (A) Lane 1, 1000 nt ladder. Lanes 2–4, CD46 exon 5–11 primer set giving no product from A. agrarius or A. sylvaticus testicular RNA, but a 585 bp product from BALB/c testicular RNA. (B) Lane 1, 1000 nt ladder. Lanes 2–4, CD46 exon 5–11 primer set using an A. sylvaticus-specific exon 5 primer giving two products of 509 bp and 564 bp from A. agrarius testicular RNA, and a single 326 bp product from A. sylvaticus testicular RNA, but no product from BALB/c testicular RNA. (C) Lane 1, 1000 nt ladder. Lanes 2–4, 3'-rapid amplification of cDNA ends (3'-RACE) reactions giving products of 204 bp from A. agrarius and A. sylvaticus testicular RNA, and a product of 150 bp from BALB/c testicular RNA. (D) Lane 1, 1000 nt ladder. Lanes 2–4, 5'-RACE reactions giving a product of 353 bp from BALB/c testicular RNA, and various truncated products from A. agrarius and A. sylvaticus testicular RNA. Key: Aa, A. agrarius; As, A. sylvaticus; B, BALB/c. A. agrarius CD46 amplicons were purified and sequenced. The smaller A. agrarius CD46 amplicon was 183 bp larger than the corresponding A. sylvaticus amplicon. Sequencing revealed that the disparity in size was due to the absence only of exon 7 from the larger A. agrarius transcript compared to the absence of both exons 6 and 7 from the A. sylvaticus CD46 transcript. The complete nucleotide and predicted amino acid sequence of the smaller A. agrarius CD46 isoform is shown in Figure 2. Complete nucleotide and predicted amino acid sequence of A. agrarius testicular CD46. The nucleotide sequences of the signal peptide (SP) to transmembrane (TM) domains are identical in both A. agrarius CD46 isoforms. Both isoforms are missing the serine/threonine/proline-rich (STP) domain. However, the A. agrarius CD46 isoforms have alternative cytoplasmic tails (CYT-A and CYT-B). The larger isoform has a 55 bp insertion (underlined) between exons 10 and 11, resulting in a longer cytoplasmic tail (CYT-B). A. agrarius CD46 mRNA sequences are available on the GenBank database [GenBank: FJ211179] and [GenBank: FJ211180]. Sequencing of the larger A. agrarius exon 5–11 amplicon revealed that exon 7 is also absent from this transcript. However, there was an additional 55 nucleotides inserted between exons 10 and 11. This 55 nucleotide insert had 96% homology to a 55 nucleotide sequence within intron 10 of the C57/BL mouse CD46 gene. Therefore, this 55 nucleotide insert in the larger A. agrarius CD46 transcript is likely to have been encoded from the equivalent intronic region of the A. agrarius CD46 gene. Figure 2 shows the location and nucleotide sequence of this 55 nucleotide insertion. Two nucleotide polymorphisms were revealed in A. agrarius CD46 mRNA, at nucleotides 6 (C or T) and 125 (A or G) (Figure 2). This is consistent with the previous observation that both inter- and intra-species polymorphisms in the CD46 gene occur in the Apodemus genus, unlike in the Mus genus . Surprisingly, none of the alternatively spliced CD46 transcripts previously identified in other species of the Apodemus genus (Johnson et al., 2007) were detected in the testis of A. agrarius. Also, no CD46 transcripts incorporating all exons were detected using A. agrarius testicular RNA. RT-PCR was supplemented with 3'- and 5'-RACE to obtain the complete nucleotide sequence of A. agrarius CD46 mRNA. Like CD46 transcripts from other species of the Apodemus genus, testicular CD46 transcripts from A. agrarius have a 54 nucleotide AU-rich (70.4%) extension to the 3'-UTR (Figure 1C). In addition, the majority of A. agrarius 5'-RACE amplicons terminated prematurely within exons 1 and 2 (Figure 1D). Amino acid sequences were predicted from the A. agrarius CD46 mRNA sequence data (Figure 2). If translated in vivo, the A. agrarius CD46 proteins would be lacking the STP domain. The exon 7 splicing event did not disrupt the open reading frame, and hence could not introduce a premature termination codon. However, the 55 nucleotide insertion between exons 10 and 11 of the larger A. agrarius CD46 transcript introduced a shift in the open reading frame, resulting in an alternative termination codon (Figure 2). Consequently, if translated, the larger A. agrarius CD46 isoform would have a slightly longer cytoplasmic tail (Figure 2, CYT-B) with a different amino acid sequence to the smaller isoform (Figure 2, CYT-A). The predicted A. agrarius CD46 proteins differ from those predicted in other Apodemus species, which would lack the SCR3, SCR4 and STP domains . Immunocytochemistry was conducted using sperm from wild-caught A. agrarius mice to determine whether CD46 protein is indeed expressed. No staining was observed on the acrosomal membrane of A. agrarius epididymal sperm using an affinity-purified rabbit anti-A. sylvaticus CD46 peptide polyclonal antibody or a rat anti-rat CD46 polyclonal antiserum; in contrast, strong acrosomal staining was observed on M. m. musculus epididymal sperm using both antibodies (Figure 3). A. agrarius epididymal spermatozoa fail to express CD46 protein. Immunostaining for CD46 (green) in the acrosomal region of epididymal sperm from M. m. musculus (A and C) and A. agrarius (B and D) using an affinity-purified rabbit polyclonal antibody against A. sylvaticus CD46 SCR1 peptide (A and B) or a rat polyclonal antiserum against rat CD46 (C and D). Phase contrast micrographs showing the head morphology of M. m. musculus (E) and A. agrarius (F) sperm. Nuclei are counterstained with DAPI (blue). Scale bars represent 10 μm. 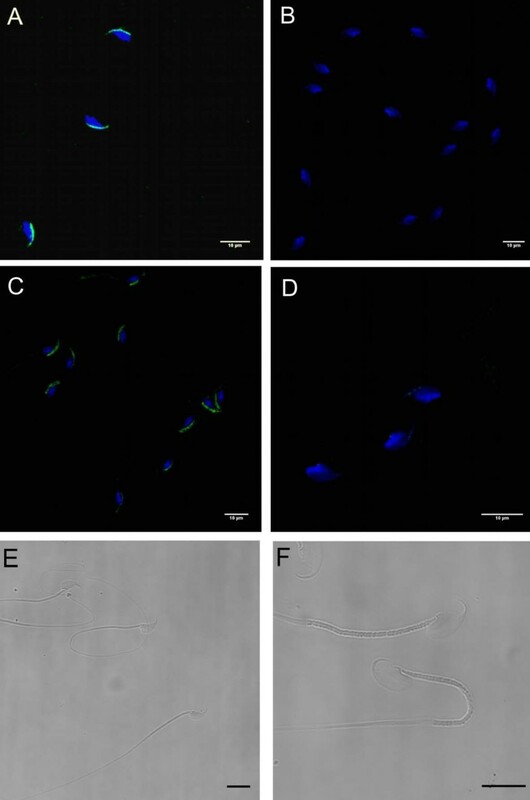 The spontaneous acrosome reaction rate of epididymal sperm was measured and compared with wild-caught A. agrarius, A. sylvaticus and M. m. musculus (Figure 4). The Post-hoc Tukey test demonstrated that, consistent with other species of the Apodemus genus, sperm from A. agrarius mice have a significantly accelerated acrosome reaction rate compared to sperm from wild-caught M. m. musculus (p < 0.001). The acrosome reaction rate of A. agrarius sperm was also significantly faster than that of A. sylvaticus sperm (p < 0.001). These findings add strength to the hypothesis that failure of sperm to express CD46 protein destabilises the acrosome, resulting in an accelerated acrosome reaction rate. A. agrarius spermatozoa have an accelerated spontaneous acrosome reaction rate. The spontaneous acrosome reaction rate is significantly faster for A. agrarius sperm compared with A. sylvaticus (p < 0.001) and M. m. musculus (p < 0.001) sperm. Each data point represents the average acrosome reaction rate of eight mice. Wild-caught A. agrarius mice transcribe two unique alternatively spliced testicular CD46 mRNA transcripts which are both different from those described previously in other Apodemus species . Exon 7, encoding the STP domain, has been spliced from both of the A. agrarius CD46 transcripts. 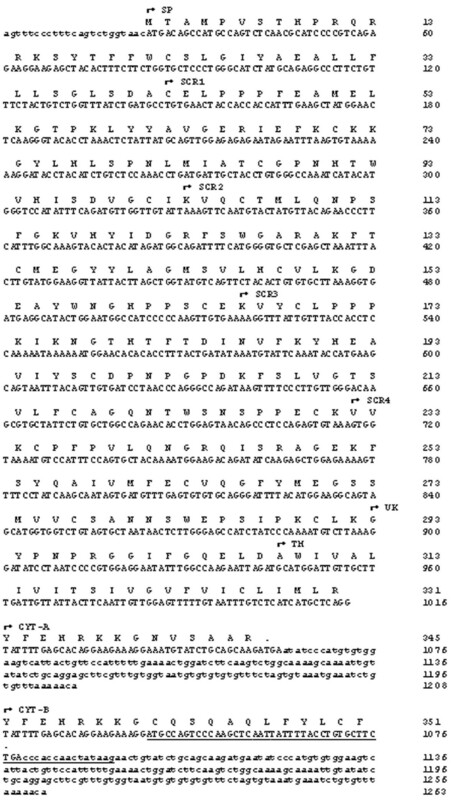 The larger A. agrarius transcript has a 55 nucleotide insert between exons 10 and 11, encoded from intron 10 of the CD46 gene. This insertion disrupts the open reading frame, resulting in an alternative termination codon, located 33 nucleotides later than in the smaller CD46 transcript. If translated in vivo, the larger isoform would have an alternative novel 20 amino acid cytoplasmic tail. The acrosome of wild-caught M. m. musculus epididymal sperm showed strong positive staining using both an affinity-purified rabbit anti-A. sylvaticus CD46 peptide polyclonal antibody and a rat anti-rat CD46 polyclonal antiserum. In contrast, no staining was observed on the acrosomal membrane of A. agrarius epididymal sperm. The predicted A. sylvaticus CD46 peptide, against which the polyclonal antibody was raised (Johnson et al. 2007), is identical to the corresponding amino acid sequence in A. agrarius. Therefore, if CD46 protein is indeed expressed by A. agrarius sperm, it should have been detected using this antibody. As in the other species of the Apodemus genus studied previously , testicular CD46 transcripts in A. agrarius have a 54 nucleotide AU-rich extension to the 3'-UTR and a truncated 5'-UTR. Several mechanisms could explain the absence of CD46 protein expression by A. agrarius sperm. 3'- and 5'-UTRs can modulate the transport of mRNA out of the nucleus, translation efficacy, subcellular localisation and mRNA stability [19–21]. AU-rich elements (AREs) are sequence motifs located in the 3'-UTR of some mRNAs and are implicated in mRNA stability [22, 23]. In vitro studies indicate that degradation of mRNAs containing AREs requires the decapping/5'-3' decay pathway . The 3'-UTR of A. agrarius CD46 transcripts resembles a class III ARE. It is possible that the 'ARE' in the 3'-UTR of A. agrarius CD46 induces degradation of transcripts in the 5'-3' direction in a deadenylation-independent manner. 5'-UTRs contain several elements involved in translational control, including a 7-methyl-guanosine cap, an internal ribosome entry site, hairpin-like secondary structures and structural motifs that attract RNA-binding proteins . The majority of A. agrarius CD46 5'RACE amplicons terminated prematurely within exons 1 and 2. Therefore, most A. agrarius CD46 transcripts lack the 5'-UTR regulatory elements, the initiation codon and parts of exons encoding the signal peptide and the SCR1 domain, cumulating in failure to translate CD46 protein. As in A. flavicollis, A. microps and A. sylvaticus , minor intra-species nucleotide polymorphisms occurred in A. agrarius CD46 transcripts. Several genes expressed in mammalian spermatozoa are rapidly evolving. This may, in part, result from selection on males to achieve rapid fertilisation of ova under sperm competition [26, 27]. Thus, sexual selection in Apodemus could have driven the rapid divergence. Alternatively, and more likely, the high level of both intra- and inter-species CD46 polymorphisms in the Apodemus genus compared to the Mus genus, which has an invariant CD46 gene, may indicate neutral drift and that the Apodemus CD46 gene has escaped strict genetic control and is non-functional. This is supported by the fact that CD46 protein is not expressed by Apodemus sperm. A. agrarius CD46 consensus nucleotide sequences were aligned against the corresponding consensus sequences from the Apodemus and Mus species previously studied . The percentage homologies of CD46 mRNA consensus sequences between different species of the Apodemus genus ranged from 90.4% to 98.8%. A. flavicollis and A. microps CD46 transcripts had the greatest homology, whereas A. agrarius and A. sylvaticus CD46 transcripts had the least homology (Figure 5). Percentage homology and phylogenetic relationship between testicular CD46 transcripts from species of Apodemus and Mus. (A) The percentage homology of nucleotide sequences of testicular CD46 transcripts from species of the Apodemus and Mus genera. (B) The phylogenetic relationship (Neighbour-Joining tree) between the amino acid sequences of testicular CD46 from species of the Apodemus and Mus genera. The scale bar represents the distance between sequence pairs using the Poisson model with rate variation among sites. The accession numbers of A. agrarius, A. flavicollis, A. microps, A. sylvaticus and BALB/c (Mus) CD46 mRNA are [GenBank: FJ211179], [GenBank: EF216472], [GenBank: EF216473], [GenBank: EF216471] and [GenBank: NM_010778], respectively. Key: A. agrarius (Aa); A. flavicollis (Af); A. microps (Am); A. sylvaticus (As); M. m. domesticus and M. m. musculus (Mm). The predicted CD46 amino acid sequences were utilised to construct a schematic phylogenetic tree to estimate the relationship between CD46 from species of the Apodemus and Mus genera (Figure 5). The tree was constructed using the Neighbour-Joining method, with complete deletion of gaps, Poisson correction and different evolutionary rates with a gamma parameter of one, using Molecular Evolutionary Genetic Analysis (MEGA) version 4.0 . 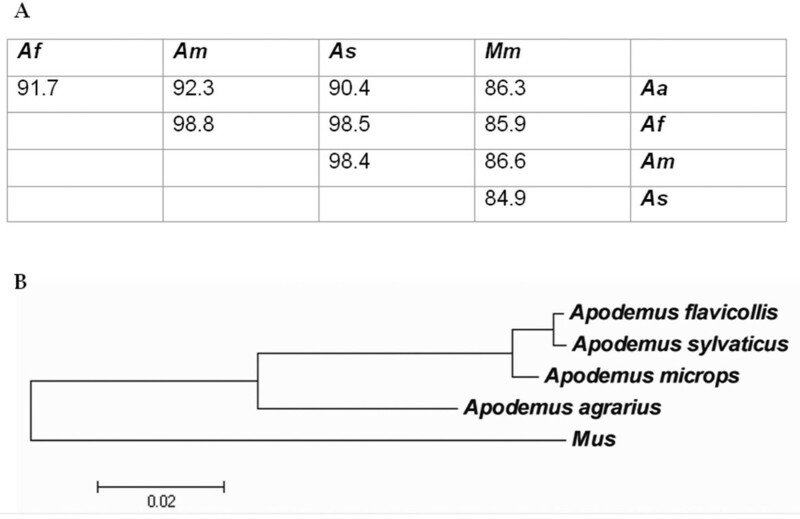 Analysis of nucleotide sequence homologies and the amino acid phylogenetic tree illustrate that, following the separation of Mus and Apodemus, the divergence of A. agrarius precedes the more recent divergence of A. microps, A. sylvaticus and A. flavicollis. Exon 7 is spliced out of CD46 transcripts from all Apodemus species studied, but is present in Mus CD46 transcripts. This indicates that the genetic changes that cause exon 7 to be spliced from Apodemus CD46 pre-mRNA occurred following the divergence of Apodemus from Mus. In contrast, exon 5 and 6 splicing events were observed in A. flavicollis, A. microps and A. sylvaticus  but were not observed in A. agrarius, indicating that the polymorphism(s) responsible occurred after A. flavicollis, A. microps and A. sylvaticus diverged from A. agrarius. The CD46 phylogenetic tree is consistent with previous phylogenetic trees constructed using data derived from sequencing of the cytochrome b and the interphotoreceptor retinoid-binding protein genes, also indicating that species of the Sylvaemus subgenus (i.e. A. flavicollis, A. microps and A. sylvaticus) tend to be closely related to one another . Like sperm from wild-caught A. flavicollis, A. microps and A. sylvaticus, sperm from wild-caught A. agrarius fail to express CD46 protein and have a significantly faster spontaneous acrosome reaction rate compared to wild-caught Mus and inbred BALB/c mice . Dissociation of Apodemus sperm trains may be assisted by a significant proportion of sperm undergoing an accelerated acrosome reaction . The high concentration of hydrolytic enzymes released may bypass zona pellucida (ZP) binding, enabling an acrosome-reacted sperm to fertilise the oocyte. Acrosome-reacted mouse sperm are able to fertilise ZP-free eggs and produce normal offspring . Thus, spermatozoal CD46 protein expression may have been traded for an unstable acrosome, enabling the dissociation of sperm trains via a premature acrosome reaction and favoring more rapid fertilisation. Interestingly, the acrosome reaction rate of A. agrarius sperm was also significantly faster than that of A. sylvaticus sperm. Sperm with the fastest binding rates are selected when multiple males are competing to bind with the oocyte . A. agrarius mice have significantly larger testes and a slightly higher proportion of litters with multiple paternity than A. sylvaticus mice . This suggests that A. agrarius sperm are subject to higher levels of sperm competition than A. sylvaticus sperm, which may have driven the selection of a faster acrosome reaction rate. Sperm from CD46 gene-disrupted mice also have an accelerated spontaneous acrosome reaction rate compared to wild-type control mice , and Apodemus mice appear to be naturally occurring null phenotypic analogues of CD46-/- knockout mice. Like CD46-/- mice, Apodemus mice do not exhibit any abnormalities in spermatogenesis or fertilisation, supporting the concept that the primary role of CD46 on acrosome-reacted sperm is not protection against complement-mediated damage. Instead, spermatozoal CD46 in rodents may have an important role in maintaining acrosome integrity. The precise molecular mechanism by which this is achieved can only be speculated at present. CD46 is a receptor for pathogenic Neisseria . Levels of cytoplasmic calcium are elevated following binding of Neisseria pili to host cells, due to release of calcium from intracellular stores. Antibodies against CD46 block this increase in cytoplasmic calcium levels, indicating that CD46 is involved in signal transduction . The induction of calcium mobilisation by CD46 signaling may be relevant to the acrosome reaction, and perhaps perturbed in mice that do not express CD46 protein or in promiscuous mice susceptible to venereal infection. Disruption of spermatozoal CD46 could also affect the distribution of membrane proteins which associate with it, including β1 integrins . Integrins interact with several cytoskeletal proteins, including actin . CD46/CD3 costimulation of T cells results in morphological changes and actin relocalization . Cytoskeleton restructuring throughout capacitation is crucial for successful membrane fusion prior to the acrosome reaction. CD46 associates with kinases (including Erk1/2 and MAPK) both directly and indirectly through integrins [35, 36], and Erk1/2 and p38 MAPK are involved in the acrosome reaction . CD46 may thus be involved in intracellular signaling events related to the acrosome reaction. Failure to express CD46 protein in Apodemus, including A. agrarius, may alter intracellular signaling and destabilise the acrosomal region. A. agrarius mice transcribe two unique alternatively spliced CD46 transcripts, with truncated 5'- and extended 3'-UTRs. The majority of A. agrarius CD46 transcripts are lacking 5'-UTR regulatory elements, in addition to the initiation codon, resulting in failure to translate CD46 protein. A. agrarius has a significantly faster acrosome reaction rate than Mus and, indeed, A. sylvaticus. Absence of CD46 protein expression is associated with acrosomal instability in rodents. Spermatozoal CD46 protein expression in A. agrarius may have been traded for an unstable acrosome, enabling the dissociation of sperm trains via a premature acrosome reaction. This favours more rapid fertilisation, providing an unexpected molecular mechanism to increase competitive sperm advantage in this highly promiscuous species. We are grateful to M. Mizuno, C. L. Harris and B. P. Morgan (Cardiff University, UK) for providing the rat anti-rat CD46 antibody, and H. D. M. Moore (University of Sheffield, UK) for providing the monoclonal antibody 18-6. We are grateful also to M. Stanko for help with obtaining A. agrarius mice in Slovakia. The A. agrarius CD46 cDNA sequences are available at the GenBank database [GenBank: FJ211179] and [GenBank: FJ211180]. Financial support was from the Heggie Trust, GACR 206/07/0779, MSMT VC 1M06011 and MSMT VZ 0021620828. LEC carried out the molecular genetic studies and drafted the manuscript. PA and KDH conducted the acrosome reaction rate experiments. MF carried out immunocytochemistry experiments to determine CD46 expression. PS and JB carried out the phylogenetic analysis. PMJ and KDH conceived of the study, and participated in its design and coordination. PA, PS, JB, BFF, PMJ and KDH helped to revise manuscript drafts. All authors have approved the manuscript.